Earlier tonight, Erik Seidel defeated Chris Moneymaker to take down the 2011 National Heads-Up Poker Championship for $750,000. This win gives Seidel $14,697,297 in total lifetime tournament cashes, which means that he has now passed Daniel Negreanu to take the #1 spot on the all-time tournament money list. Just six short months ago, Erik Seidel was sitting in 11th place on the all-time money list, far behind the likes of Daniel Negreanu and Phil Ivey. Over the past two months, Seidel has gone on a legendary run that has seen him collect over $4.3 million in total cashes. Erik Seidel's first recorded cash came all the way back in 1988 when he famously finished in second place to Johnny Chan in the World Series of Poker main event. While countless other poker players have come and gone, Erik Seidel has managed to remain remarkably consistent, even in the age of the Internet player. In fact, Seidel seems to be getting better with each passing year. 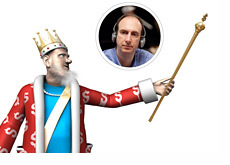 Erik Seidel is one of the game's all-time great players, and it's nice to see him at the top of the all-time money list.